Respondents in Denmark said that payment delays occur most often due to buyers using outstanding invoices as a form of financing. The country had the highest percentage of respondents who reported this in the Western Europe region overall. At 1.8%, the proportion of uncollectable B2B receivables is the second highest in the region and, despite a significant decrease in 2018, bankruptcy remains the main reason for write-offs. Similarly to what was observed in previous surveys, respondents in Denmark are very inclined to sell on credit terms to their B2B customers. 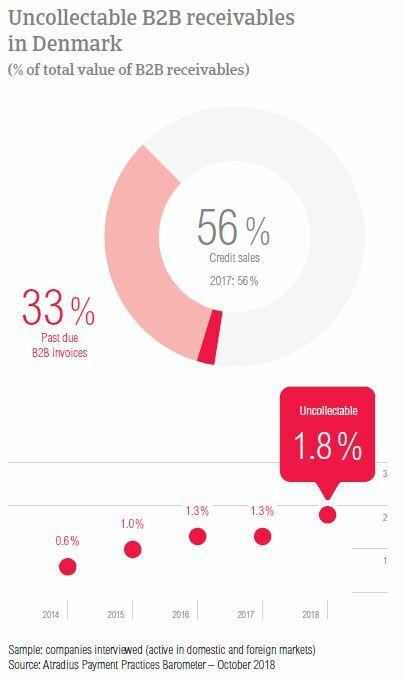 In 2018, the proportion of B2B sales transacted on credit is stable at 56.2% (in 2017 it stood at 56.4%). There is a clear preference for trading on credit with domestic B2B customers over foreign B2B customers. 63.3% of B2B transactions on credit are domestic and a lower 49.0% are foreign. The main reasons for granting trade credit in Denmark are solid relationships with trusted B2B customers and credit sales as a common practice. Respondents here also mentioned that they sell on credit because their B2B customers demand it and it helps them gain new business, both domestically and internationally. We grant trade credit because this is our customers’ requirement. 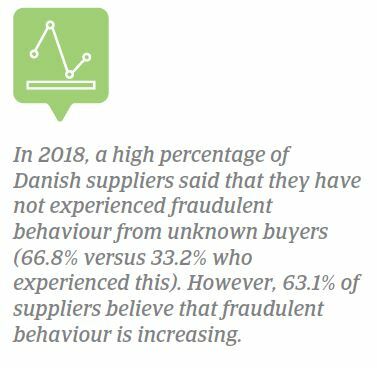 Danish suppliers said that if they were confronted with poor payment behaviour or lacked information on the customer’s business or payment performance, they would refrain from selling on credit to their domestic B2B customers. A very low percentage of respondents mentioned each of these reasons (7.7%) highlighting once more the very open stance to selling on credit. In regards to B2B customers abroad, 36.8% of Danish respondents mentioned that they would not trade on credit if they lack information on the customer’s business or payment performance. 31.6% mentioned that they would not sell on credit if there were high economic or political risks in the customer’s country. We have long-term customers and granting credit so far has led to successful cooperation. 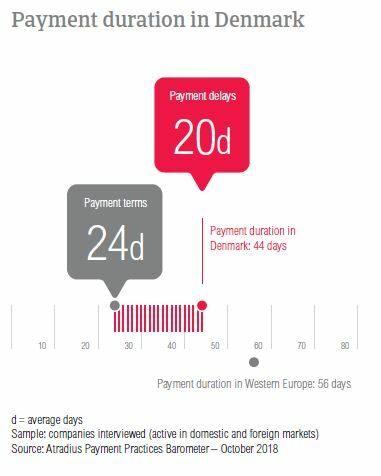 In 2018, 79.7% of Danish respondents experienced late payment. Denmark had the second lowest percentage of respondents who reported this and has seen the biggest year-on-year decrease in Western Europe. Payment delays occurred almost as often with domestic B2B customers as with B2B customers abroad (80.7% versus 78.7%). In 2018, the proportion of past due B2B invoices in Denmark is stable at 32.7% (32.3% in 2017). This is the lowest in the region and far below the regional average of 41.8%. Foreign B2B customers had a higher default rate than domestic B2B customers. Average Days Sales Outstanding (DSO) of respondents in Denmark is 32 days, one day shorter than in 2017. This is the second lowest DSO figure in the region, after that of Austria, and much lower than the average for the region (44 days). However, 19.1% of Danish respondents foresee increases in their companies’ DSO over the coming 12 months. A slightly lower 14.6% expect deterioration. The majority, (66.3%) do not expect changes over this time frame. Historically, suppliers in Denmark have given their B2B customers some of the shortest payment terms in the region. This is also the case in 2018, when only a small change was registered. 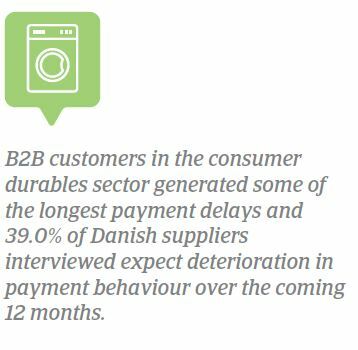 Domestic B2B customers in Denmark receive, on average, 24 days to settle payments (23 days in 2017). Foreign B2B customers are also asked to pay within 24 days on average (no change from 2017). 50.0% of Danish respondents said that they are not likely to differentiate payment terms between domestic and foreign B2B customers. Of those who mentioned that they are likely to differentiate, 32.0% said that they would give their domestic B2B customers less time to settle invoices. A lower 18.0% said that they give their domestic B2B customers more time to pay. Respondents in Denmark said that the main reasons for differentiating payment terms are industry practices, domestic payment terms directed by law, internal policies and the political stability in the export country. In 2018, Danish respondents experienced increased delays from their B2B customers. Domestic B2B customers delayed their payments on average 19 days (one day longer than in 2017) while foreign B2B customers delayed payments 20 days (16 days in 2017). The changes in payment terms and payment delays caused a small increase in the average payment duration. This stands at 44 days and is three days longer than one year ago. Despite the increase, Denmark has one of the shortest payment durations in the region. Compared to their peers in Western Europe, Danish respondents need almost two weeks less to convert B2B invoices into cash. Based on our survey findings, the main reason for domestic payment delays in Denmark is buyers using outstanding invoices as a form of financing, mentioned by 38.6% of respondents. There was a decrease from 2017, when this reason was mentioned by 42.2% of respondents. 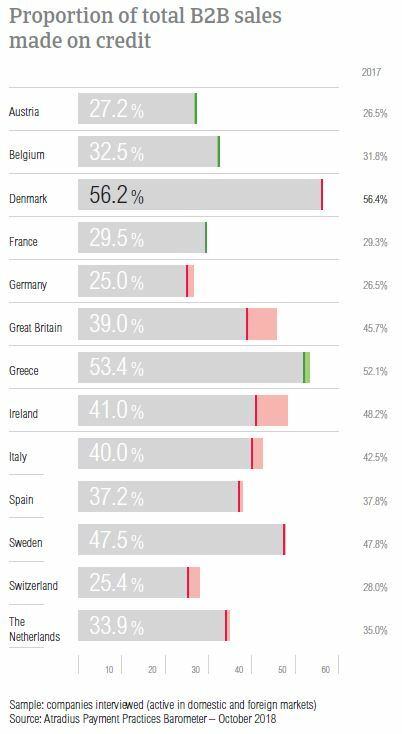 However, Denmark still has the highest percentage of respondents in Western Europe citing this reason. Domestic delays also occurred because of insufficient availability of funds (mentioned by 23.5% of respondents). Foreign payment delays were reported to occur mainly because of the complexity of the payment procedure and buyers using outstanding invoices as a form of financing (mentioned by 31.8% and 30.7%). 51.7% of Danish respondents said that overdue B2B invoices did not have a significant impact on their businesses. Of the respondents who mentioned negative consequences, 13.8% said that they needed to take specific measures to correct cash flow and 12.6% that they had to delay investment in property, plant and equipment. 10.3% of Danish businesses lost revenue because of this. In Denmark, suppliers are mostly invoicing their B2B customers online. 79.3% stated that they are already doing so while another 9.1% want to make the move to e-invoicing this year. A low 10.1% said that they are not e-invoicing and don’t plan on doing so this year and 1.4% that they are no longer e-invoicing. After invoicing their B2B customers online, 52.9% of Danish respondents received payments faster. 41.3% of respondents said that electronic invoices did not have a noteworthy effect on payment duration and 5.8% experienced slowdowns in payment. Like most of their peers in Western Europe, respondents in Denmark perceive US protectionism turning into a trade war as the most significant potential risk to global development (more significant than misguided Fed policy, China’s ‘hard’ landing and geopolitical risk). The 59.6% of respondents in Denmark citing this as the main threat to global growth is by far the highest percentage in the region. Another 16.4% of respondents in the country believe that – while US protectionism may not be hampering global growth the most – it is definitely a significant risk. Only 14.6% of Danish respondents viewed US protectionism as the least significant risk to global development. The survey’s biggest negative change in the proportion of uncollectable receivables was recorded in Denmark (up from 1.3% in 2017 to 1.8% in 2018). Denmark’s average proportion of uncollectable receivables is the second highest after that of Greece. 1.4% of domestic receivables were written off as uncollectable compared to 0.4% of foreign B2B receivables. 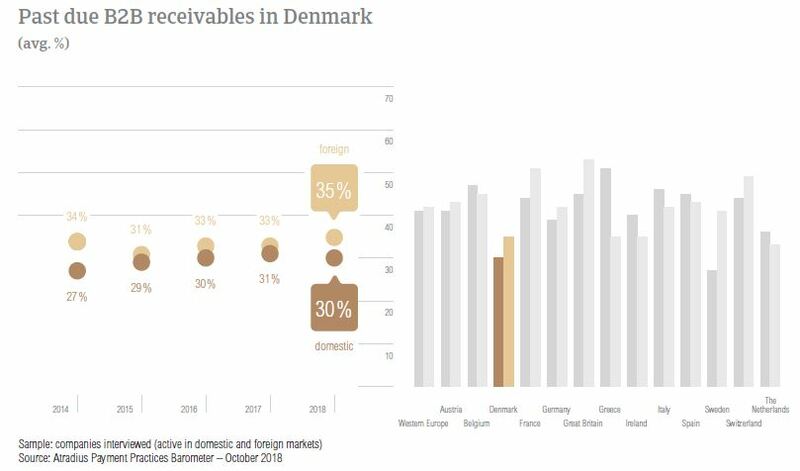 In Denmark, uncollectable receivables originated most often from the construction, consumer durables, electronics, business services and services sectors. The main reason why B2B receivables were uncollectable was bankruptcy. 46.6% of respondents stated this reason, a decreased percentage compared to 2017 (57.4%). Other main reasons for write-offs were the failure of collection attempts (21.4%) and the inability to locate the customer (20.4%). As mentioned before, in 2018, the average payment term given by Danish respondents is 24 days, one of the shortest in the region. The longest payment terms were given to B2B customers in the agriculture and transport sectors (on average, 40 and 32 days respectively). Average payment terms for B2B customers in the services sector of 15 days are much shorter than the country average. In 2018, B2B customers in the construction and consumer durables sectors generated some of the longest payment delays. Based on our survey findings, customers in these sectors paid, on average 22 days and 21 days late. Top reasons behind payment delays in the construction sector are buyers using outstanding invoices as a form of financing (mentioned by 38.0% of Danish respondents) and the complexity of the payment procedure (28.0%). In the consumer durables sector, 31.0% of suppliers stated buyers using outstanding invoices as a form of financing and the inefficiencies of the banking system. 62.0% of respondents in the construction sector and 49.0% in the consumer durables sector said that they do not foresee any changes in the payment behaviour of their B2B customers over the next 12 months. Suppliers in these sectors said that should changes occur, these would probably be for the worse. 23.0% of Danish respondents in the construction sector expect deterioration (versus 14.0% who expect improvement). A high 39.0% of respondents in consumer durables said that they expect deterioration (versus 13.0% expecting improvement). Having drawn from the expertise of Atradius Collections' local offices, the International Debt Collections Handbook explains the different regulations and procedures for debt collections in Denmark.